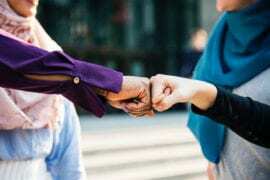 How to use The Ultimate ProductiveMuslim Goal Planner ? It’s quite simple – for each of the 6 areas in the first column, think about what your 6-month goals are. E.g. For the Islam area, it might be praying 5 times a day on time every day, or early in its time, or adding Sunnah/Nafl prayers (depending on what stage you are at). 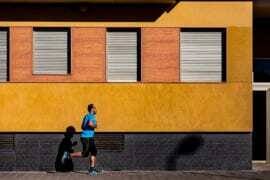 For the Personal one, it might be to go to the gym 3 times a week, etc. Don’t put more than 3 goals at this stage for each area of your life otherwise it’ll be too much to handle. Once you’ve completed the above for the 6-month goals, repeat the same exercise but for 1 year. The best way to do this is to ask yourself: “In 1 year, where do I want to be in this area of my life?” And from that question you can derive your 1 year goal. Some examples include: I want to complete my professional qualification within a year, for example. Repeat the above for 5 years, 10 years, and 20 years…probably by this time, you’re getting a headache because you’re not used to thinking this far ahead in the future. But that’s ok, do all this with ‘insha’Allah’ in mind as death may reach us sooner – but thinking so long-term and into the future helps develop a direction for yourself, puts things into perspective, and might even change your short term goal(s). So try and imagine what you would like to achieve in 20 years for that particular area of your life. For example, for the family area, you might want to be a loving and ‘fun’ dad who has an excellent relationship with his children. Let’s stick with the example of being a loving and ‘fun’ dad, if you’ve set that as your 20 year goal, then this would affect your other goals such as your work goal (you’d choose jobs that don’t require a lot of travel for example) or your community goal (you’d choose to get involved in community projects that you and your children can work together on), etc. Now comes the ultimate test; if you’ve set your 6 months, 1 year, 5 years, 10 years, and 20 years goal and you found that they are now all aligned and you’re happy with it…Test those goals against the “Akhira” column. What impact will achieving that goal have on you in the Akhira? Trust me, this is probably the traumatic stage as it might turn your goals upside down. For example if someone is passionate about banking & investment and set themselves a 20-year goal to be CEO of the biggest Riba-based bank in the world. Once you’ve tested it against the Akhira column and realize that you will lose and ruin your akhira, your eternal life, with such a goal, you’ll end up completely changing your goals and perhaps even change careers (Islamic banking, perhaps?). 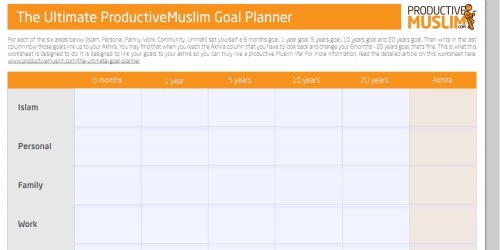 So, this is the ProductiveMuslim Goal Planner. It’s a pragmatic, pen and paper tool to help you think about your goals, prioritize your goals and more importantly assess whether such goals will ultimately be a source or reward and happiness, or loss and regret in the Akhira. Let me know how you use it below or if you have any questions! You can also share your experience of using the worksheet on this shared document .We look forward to hearing your responses.